Finnish artist Jani Leinonen is shocked at the anger his "McJesus" sculpture has caused within the Christian Arab community in Haifa, Israel, since he asked the museum to remove the work four months ago. "The news about the demonstrations came to me as an upsetting surprise particularly because the artwork called McJesus (made in 2015) is in the exhibition against my wishes," Leinonen told Euronews. The artist said he asked the curator of the exhibition back in September to remove the artwork because he had joined the Boycott, Divestment, and Sanctions (BDS) movement, which pressures Israel to change its policies towards Palestinians. "Based on the reply from the curator where she said she was sorry about my decision but has forwarded my message to the management, I assumed that the artwork had been taken out of the exhibition. That was almost four months ago," he said. Leinonen said he sent another request to the curator on Saturday to remove the sculpture when he learned about the protests. The artist said he hasn't heard anything back from the museum and that he hopes that his work is no longer featured in the exhibition. The Haifa Museum of Art gave no comment to Euronews on the topic. The "McJesus" sculpture by Leinonen has angered the Christian Arab community in Haifa, Israel, who see it as an insult to their religion. 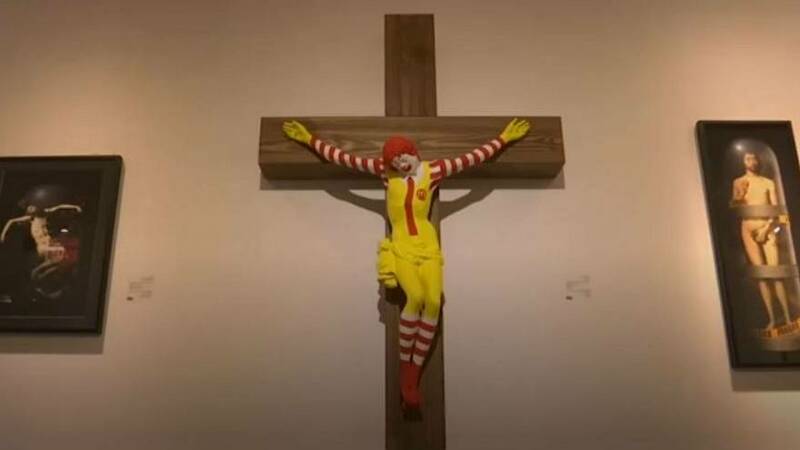 People from the Christian Arab community protested for the removal of the crucified Ronald McDonald outside the museum last week. Demonstrators threw stones that wounded several police officers while authorities scattered crowds with tear gas and stun grenades. The museum director told The Associated Press the sculpture wasn’t meant to offend anyone and that it was a criticism of modern capitalist culture.